First Solar was felled by the industry's woes. Last week, First Solar's (NASDAQ:FSLR) stock plummeted 20% in a move that caught solar investors off guard. The plunge was caused by China cutting solar incentives for the rest of 2018, which could reduce the country's solar installations by 30%-40% in 2018, a big deal considering China installed about half of all solar panels worldwide in 2018. First Solar was supposed to be insulated from some of the ups and downs most solar manufacturers experience, with its rock-solid balance sheet and billions in contracted sales, but clearly that didn't matter last week. It's worth considering why investors are abandoning this solar stock and whether this is a buying opportunity for those with a longer investment horizon than a few days or weeks. 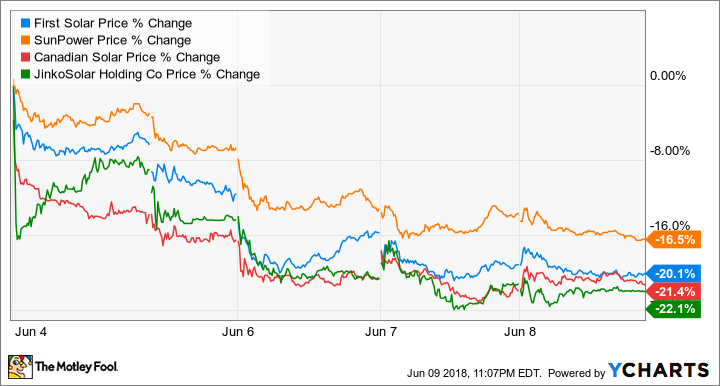 First Solar wasn't the only solar stock that dropped last week -- the plunge was an equal-opportunity event for the industry. China cut feed-in tariffs for all solar projects and eliminated planned ground-mounted solar projects for the rest of the year, which is expected to reduce China's solar installations from 53,000 megawatts (MW) in 2017 to an estimated 35,000 MW in 2018, according to analysts from Roth Capital. The analysts also think there may be as much as 30,000 MW oversupply of solar panels in the second half of the year, and that would likely send panel prices dramatically lower. FSLR Price data by YCharts. The last time the solar market was significantly oversupplied was in the first quarter of 2017, when panel prices fell to $0.38 per watt. By late 2017, high demand in China and the U.S. pushed panel prices to $0.48 per watt and manufacturers have enjoyed strong margins as a result. But there's nothing to prevent panel prices from falling again and China's cuts may lead to the price plunge that manufacturers fear. First Solar has done a great job taking advantage of high solar panel prices and its position as a tariff-free importer into the U.S. to book high-margin (20%-plus gross margin) long-term sales. On April 26, 2018, the company had 10,600 MW of bookings, but recent capacity expansions will bring annual production to 7,600 MW by the end of 2020. The added capacity may now need to be sold at the new lower market price than it would have a few weeks ago, which could hurt margins. Between now and early 2022 (when solar panel import tariffs expire), the company has about 12,000 MW of unsold solar panel production, or over half of all of its production. And the value of that production may fall by 30% or more if China's solar reductions cause a solar panel price plunge, as analysts expect. Now, the 20%-plus gross margin management had previously expected from solar panels may be a thing of the past. Given the possibility that solar panel prices could drop 30%, single-digit margins for some sales aren't out of the question. At the end of the day, solar panels are a global market that's priced much like a commodity. Oversupply will push prices and margins lower for every manufacturer, and First Solar won't escape the market's dynamics. The 10,600 MW in bookings will ease the pain for a while, but unless all of that capacity can be absorbed by places outside China there is a good chance that new panel sales will carry much lower price tags.